Yes, video is the perfect medium for beauty brands to build their brand, following a transformative story – the before and after. Video demonstrates what the products can achieve bringing the authenticity of the makeup counter and credibility of peer recommendations to e-commerce channels. Have beauty brands got their video marketing strategy right? However, many beauty brands are still missing a trick when it comes to their video strategy just placing ads on their YouTube channel and failing to create evergreen content. According to a study from Pixability, YouTube’s successful beauty brands vary video lengths five times more often than less engaging companies and publish content targeting users throughout the buying journey. 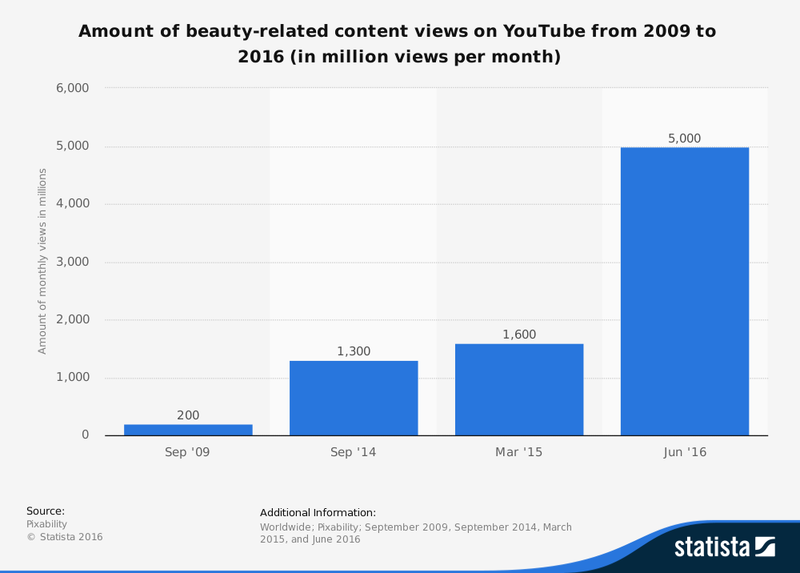 If you look at the chart above at the growth of beauty-related video content, you can see that to cut through you need to get your video content strategy spot on. I’m going to look at Google’s hero, hub and help advice to help your marketing team improve results with video. The HHH content plan will not work effectively if it’s not backed by the right marketing strategy. Dove is a real hero in the FMCG beauty market with its Real Beauty content all furthering the brand purpose of improving women’s relationship to the way they look. Let’s look at an example from Avon where the brand puts its planning and audience insight at the heart of the creative. The beauty brand’s research showed that people had concerns around the quality of the product. However, when blind tested, nine out of ten would recommend Avon’s foundation and eight out of ten would switch to their skincare brands. Their brand campaign #Makeupyourownmind stems from this with a series of ads showing how people’s perceptions of the brand change once they actually try them. The campaign gains authenticity from its collaboration with beauty influencers, who were sent a secret package of beauty products to unbox. Their reactions on testing their presents were filmed ending on the big reveal that the products were actually from Avon. The TV and online ads were backed with videos focusing on the individual bloggers – the kind of content which would not look out of place on their channel as a customer unboxing video. This is perfect partnership for all parties; extending Avon’s reach with the vloggers’ engaged audience. Shoppable video is powerful. It combines storytelling with product demonstrations and a clear CTA to add to the shopping cart increasing the ROI of video from window shopping to “buy now”. There is a real opportunity for brands to use the tech at their disposal and test shoppable campaigns. Charlotte Tilbury drew on such content effectively in the brand’s “Project Confidence” campaign to help women reach a goal after a makeover. The story moves from an authentic plea for help on a smartphone to a makeover with Charlotte Tilbury herself and a successful outcome with the customer fulfilling her dream to get back on stage again. This film is about more than the products; it’s the potential of what you can achieve with them. Hub content needs to be posted at regular intervals to remind your audience about what you offer, maintain brand awareness and increase shares. How about a monthly series of video interviews or make-overs? Can you use the same host to give your content continuity? The frequency is a balancing act between quality and quantity, where the former must win. This comes back to your audience. What are their passions? What content will resonate? When I worked at the BBC, we were of the mindset to engage the audience so that they came back for more and more. It’s the same here; which topics will encourage them to return for your next episode? Quality is so important in our world of content overload. One study released the shocking stats that only one piece of content out of 20 achieved engagement, with their hypothesis that the drive for content was lowering quality. Ensure that everything you do, has clear aims and objectives, meets brand guidelines and reinforces, rather than detracts, from your brand. Let’s look at an example from Birchbox, a makeup subscription service, which sends out a personalised beauty box every month, and creates regular content around the cycle of the box deliveries. Its YouTube channel features a monthly unboxing video where one of the team talks through her personalised box. The content here feels authentic and fits into how influencers and the brand’s fans would also talk to their audiences – like a friend sharing tips, rather than an advertiser. Birchbox is also using Facebook Live successfully. Live streaming videos are watched three times more than pre-recoded videos on the channel. The video has a clear context, chiming with the start of January reboot as a fitness blogger shares her tips. With so many searches online around relevant beauty terms, it’s vital to create content that answers their queries. Help content is designed to attract search traffic and the content brings the product alive and shows consumers the finished look. Tutorial videos generate the highest engagement rate and compose 70% of the top 200 beauty videos on YouTube. (Pixability, 2016). Being a friendly adviser offering tips works to build brand trust as well as ultimately driving sales. Here’s an example from cosmetics brand Benefit on how to fake fuller lips. Again, you need to clearly define your audience and work on ranking for the terms that will bring quality traffic to your e-commerce channels. In a recent study, 81% of views on brand owned channels were paid views generated via TrueView ads. (Pixability, 2016) The hero, hub and help content needs to be amplified through paid media. It is also an opportunity for brands to sponsor influencer tutorials to tap into new audiences. I’ve focused on YouTube in this blog as the leading channel for your beauty marketing strategy, but of course brands need to reach out to where their customers are online. Beauty consumers are engaging with video on the leading social media channels both organically and through ads. Look back on the blog soon for more tips on how to maximise your beauty brand on social. Interested in improving your branded video content? Get in touch for an audit of your content strategy or to discuss your next video campaign.